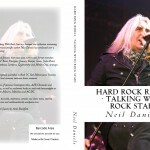 Share the post "Backstage Heroes: Interview with Neil Daniels"
I’ve got commercial biogs out this year on Pantera, UFO, Bon Jovi’s Slippery When Wet and ZZ Top. It’s pretty exciting. I’m not quite as prolific as Martin Popoff or Dave Thompson but it’s not a race and I admire those guys immensely. I like to move between the self-published stuff which fills in the gaps between the commercial releases. I’ve had 18 books published with titles on Judas Priest, Iron Maiden, Journey and Metallica as well as AC/DC and Bon Jovi. Check out www.neildanielsbooks.wordpress.com for more info on all my books. I’m also on Facebook, Twitter, Tumblr and LinkedIn. You have a UFO book coming up shortly. Does this cover the whole of the band’s era? What for you is the most underrated album(s) by the band and why? I was asked by the publisher at Soundcheck books if I was interested in a book on UFO. I jumped at the chance. It’s due in the next couple of months. It wasn’t an easy book to write as they have a very complicated history and you’re right, they are very underrated, I hope fans will enjoy the book. It covers their entire history and includes a foreword by US broadcaster Eddie Trunk who is a major UFO fan. I guess what I think is their most underrated album is Mechanix, their tenth album. There are some excellent songs on there and good clean riffs. Createspace Books have a series of titles by you including AOR and Rock & Metal Chronicles. How did you select the reviews and do you refer to fellow writers reviews for comparisons? I’ve actually just released three books via Createspace which as many people might know is Amazon’s print on demand company. AOR Chronicles and Rock & Metal Chronicles are hefty 400+ page books featuring dozens of reviews of albums mostly released over the past decade or so during the time I’ve been a writer. Hard Rock Rebels is basically my two Rock N Roll Mercenaries books (out of print) together in one 476 page book with bonus interviews. It features dozens of interviews I’ve done with members of Maiden, Priest, Queensryche, Van Halen, and many more. AOR features the “lighter” albums I’ve reviewed over the past decade and Rock & Metal features the heavier stuff while Hard Rock Rebels is a massive 476 page book that features all the Interviews I’ve done for magazines. It doesn’t include the countless more interviews I’ve done for my book work, though. Maybe I’ll put those in print some other day. I’ve written all the reviews and I’ve got many more to include in future books. 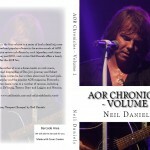 I’ve set up a page on my blog neildanielsbooks.wordpress.com which will detail all my Createspace books. My next one is a fictional rock ’n’ roll memoir about an 80s rock band. It’ll be released later this month. The Hard Rock Rebels book features your interviews with various rock stars. What for you makes for a good interview, both as the interviewer and as a fan/reader? Have you managed to interview your wish list of interviewees or do you still have some more to go? I think many musicians are very guarded now especially as managers and PR people have far more control so nothing has really surprised me per se, but I do enjoy interviewing a great deal. The times have changed; if you look back at, say, Melody Maker in the 1970s and Kerrang! in the following decade to what magazines are like now and how little freedom rock writers have you’ll see that there is a great difference. Rock writers twenty or so years ago toured the world with all the major bands but record companies don’t have the dough these days as CD sales are declining and with that so are magazine sales. When interviewing I think the main thing is to do your research and actually have an interest in who your interviewing, it’s really that simple. I’ve been fortunate enough that I’ve not had a bad interview. Every musician I’ve spoken to has given good copy…except by email. They’re a pain. I’ve been lucky but I don’t interview someone I’ve got no interest in. Sure, you get bad days and after a day at work you don’t really wanna spend hours researching and interviewing but it can be a lot of fun. Most of mine are done by phone. I don’t live the jet setting rock hack lifestyle that some seem to think and that few actually do these days. There are lots I’d love to interview – from the top of my head: Tony Iommi, Pete Way, John Miles, Steve Perry, Neal Schon, Lemmy, Meat Loaf and Roger Taylor. Too many to name to be honest. Has the increase in kindle and I Pads seen an upsurge in the sales/interest in your books? Does the printed version still have a place in music publishing do you think? It’s certainly harder to get book deals know than it was just a few years ago and sales have dropped for music biogs and advances have either stalled, decreased or been deleted in favour of royalty deals. Createspace gives writers full control but then the hard work is promoting. Most but not all of my books are out as eBooks now. My next book is Pantera due in September. Here’s info for the official press release. MONTCLAIR, NJ—Pantera’s story begins in Arlington, Texas, in the early ’80s, at a time when American metal was just coming to fruition in the form of California thrash-metal bands like Metallica and Slayer and New Yorkers like Anthrax. It was an era when traditional heavy music bands were banished to the underground by labels, press, and the industry…unless they were playing a new kind of metal. When everyone said metal was dead in the mid-’90s, Pantera was selling tons of records and concert tickets. They were the mainstream bridge from the old-school metal to the new school we have seen grow the last ten years. Influencing subgenres like nu-metal, groove metal, metalcore, and grindcore, Pantera was an inspiration to musicians trying to hang in and survive the roughest decade in real metal music. Reinventing Metal: The True Story of Pantera and the Tragically Short Life of Dimebag Darrell (Backbeat Books, Sept. 2013, $22.99) by Neil Daniels is the first biography of one of the most original, uncompromising, and influential bands in metal history. Daniels conducted many interviews with those who knew the group well to get the full story of the band, focusing on all of the members and covering their Texas high school start all the way through their global mega-success and eventual break-up. Their story is a tragic and complicated one, not only because of the murder of guitarist Dimebag Darrell in 2004, but also because of the bad blood and hostility that continues between the three surviving members. Pantera really were a unique band, innovative and dangerous. Reinventing Metal will tell you why. This entry was posted in All Posts, INTERVIEWS, Interviews/Backstage Heroes and tagged AOR, author, Bon Jovi, book, metal, Neil Daniels, Pantera, publication, rock, UFO, writer, ZZ Top. Bookmark the permalink.